One of the essential components of strategy formulation is the ability to forecast the state of one's industry in the future. With a fair amount of certainty about the future, managers can use a standard set of tools and analysis to formulate a strategy that best suits their company. However, in reality, the future is often uncertain; the state of the market forces is difficult, if not impossible to predict. Courtney, Kirkland and Viguerie in their article Strategy Under Uncertainty have developed a useful framework for dealing with this particular topic. The authors present 4 levels of uncertainty: 1) A clear-enough future, 2) Alternate futures 3) A range of futures 4) True ambiguity. 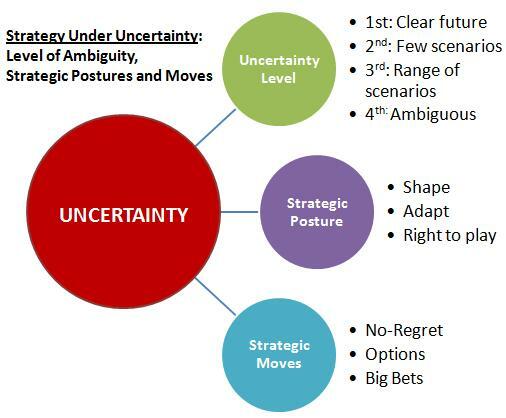 Uncertainty levels 2 and 3 are the most common, although are often omitted by managers when formulating business strategy. In fact, many think in binary terms, defining all futures as either clear or ambiguous. Uncertainty at level 2 (alternate futures) is said to be the future with a few discrete outcomes or scenarios. Each likely outcome may have its own corresponding strategic position that would have to be adapted by a company. Companies may use tools such as game theory, probabilities and decision analysis when evaluating each of the scenarios. Thinking in terms of various scenarios is a step in the right direction in comparison to thinking about the future only as if it were 100% certain or completely ambiguous. 3) Big bets or actions that necessitate a significant commitment on the part of the organization, generating a positive return under a favourable scenario and having a negative effect in other scenarios. Each of the strategic postures and actions may deem useful depending on the level of uncertainty and specific circumstances facing the company. At the same time, our experience indicates that some of these tools are more useful than others. For instance, shaping the future is more useful for new players in the industry, given the situational uncertainty levels of 3 or 4. New players can do more in changing the rules of the game as they are not tied by existing liabilities and often have spare capacities. Changes to the industry structure are usually detrimental to the incumbent's business as they alter revenue streams, cost structures and the very nature of their business. Kodak, being one the world's most successful companies in the 1980s, has effectively brought its own demise by inventing a number of key digital photography technologies. Instead, it would have been better off by maintaining the status quo, selling its film-based products, for as long as possible. In fact, in our opinion, incumbents are better off if they adapt to the future instead of trying to shape it. Often having a stronger brand, incumbents can exploit someone else's innovations to their advantage. For instance, UPS was successful in adapting to FedEx's overnight delivery model once it has proven successful. UPS did lose its market share, however remained the industry's leader. Needless to say, this was a much bigger industry post FedEx's innovation. In terms of strategic portfolio of actions, it is most preferred to use no-regret moves, i.e. the actions that generate positive returns regardless of the outcome. These may be various technology implementations that decrease costs and improve customer service and would be beneficial under all scenarios. On the other extreme are the big bets. These represent significant moves that under a certain outcome prove successful; while under all other circumstances, may result in substantial losses. We often recommend to omit placing big bets unless a company is operating under a level 1 uncertainty, i.e. the future is relatively clear. We generally believe that all good strategies are Blue Ocean Strategies, i.e. they fundamentally change how one perceives and undertakes a given activity while delivering additional value at a low cost of implementation (think Henry Ford's assembly line). Not surprisingly, we see small bets and smart innovative solutions as a better alternative to big bets and complicated bulky ideas. Options could serve as another useful strategic tool, especially if a company chooses the Right to Play strategic posture. However, what often happens is that a company dilutes the strength of its undertakings or loses focus by investing and doing too many things at once. Another important aspect of options is their cost. A company should try to minimize the variable cost of each option; this way participating in various scenarios becomes more practical. Under uncertainty, we suggest thinking in terms of multiple scenarios and sticking with no regret moves. The time of uncertainty is a great time to reshape one's industry; it is time to innovate and develop smart inexpensive solutions that increase firm's value.